I don’t often seek out vegetarian places, but I don’t shirk away from them, either, since I’ve actually been to quite a few vegetarian places (particularly Indian ones) that are quite delicious. Usually I find myself most enjoying the places that don’t try to play the meat substitute game, instead focusing on dishes showcasing the ingredients, but every once in a while I get pleasantly surprised by a place that’s doing the mock meat thing (good examples include the Wild Rice Burger at Fitger’s Brewhouse in Duluth, MN, and the Hot and Spicy Mock Duck from Camdi in Minneapolis, to name two). 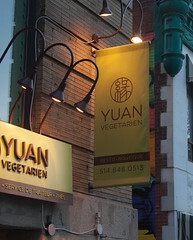 Yuan Vegetarien turned out to be one of these places: while most of the menu primarily focused on Asian-style dished made with mock meat instead of real meat, they generally did quite a good job of it. 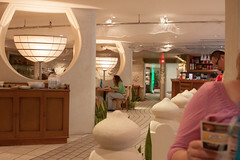 Yuan has a distinctly funky interior, with a spacious dining area filled with all sorts of sculpted concrete arches and pillars. They were also quite popular, with almost all the tables filled at 5pm on a Saturday. Most of the diners in Yuan were going for the $18 all-you-can-eat special, in which they’ve got a limited (but still having a decent selection of items) menu of options served up in tapas-sized portions that they bring out to you table cooked to order. And it was pretty tempting, but I decided instead to check out their “mock eel bento dinner”, while Carol opted for some mock beef with broccoli and a mock chicken salad, while we both split an order of spring rolls. 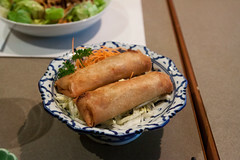 The spring rolls arrived first, and they were a pleasant start to the meal, with crisp wrappers and a nicely-spiced filling consisting mostly of cabbage and mushrooms, these were perfectly enjoyable. 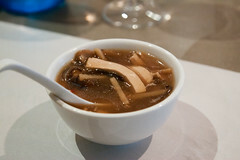 They also did a very nice job with my hot and sour soup, with a rich, flavorful spicy broth and a nice mix of both tofu and mushrooms. 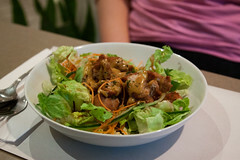 Carol’s salad was a reasonable mix of greens, with fried mock chicken and a rich, ginger-heavy dressing that I rather liked. The mock chicken was mostly a carrier for breading, but it was nicely crisped and flavorful nonetheless. Moving on the the main courses, I rather liked most of my bento box. This was a rather nice and complete assortment of items, ranging from the entree itself (the mock eel), some tofu dumplings, some braised broccoli, some edamame, and rice. The mock eel really shined, with a combination of flour, mushrooms, and seaweed giving a rather nice approximation of eel both in taste and texture. As mock meat goes, this was a rather impressive result. The dumplings, however, were a disappointment. If you were thinking “plain cubes of tofu wrapped in an unseasoned wrapper and steamed”, well, that’s what they were, with the result being an adventure in blandness. 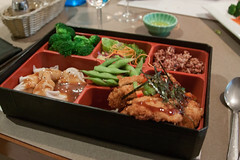 The rest of the bento box, however, was flavorful and pleasing. 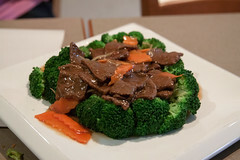 Carol did pretty well with her entree, the mock beef and broccoli, was also a reasonably good success, with nicely al dente broccoli covered with a mix of mock beef, carrots, and sauce. The mock beef was actually quite flavorful, and even had a bit of crispiness to it (which I enjoy with this dish when made with real beef). The sauce was a bit sweet (that’s usually pretty common in both Westernized Asian food and vegetarian mock meat dishes, in my experience), but it was flavorful and worked well with the broccoli. While Yuan had a few hiccups, we actually enjoyed our meal there quite a bit. And if one is particularly looking for vegetarian food, it’s probably one of the better options for Montreal.